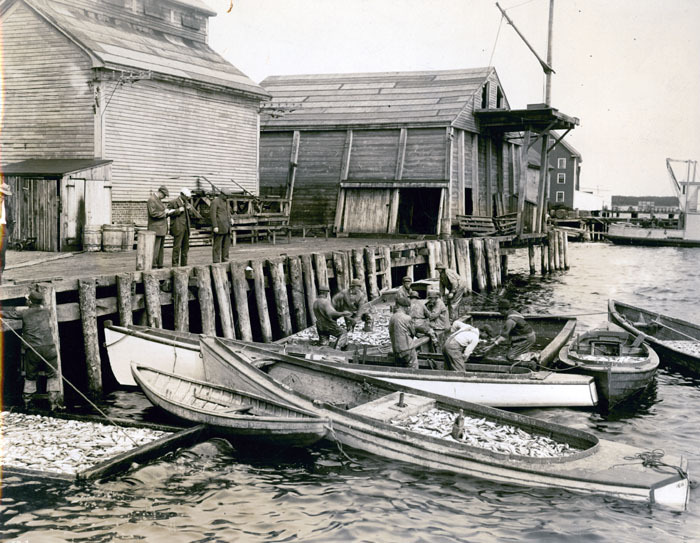 The small boats of Passamaquoddy Bay unload herring at the sardine factory wharves. Fishing a herring weir at low tide, near Eastport, Maine. This image is from G. Brown Goode's seminal work The Fisheries and Fishery Industries of the United States, 1884-1887, Section V, Plate 132. This book can be found online at NOAA. Herring drying on the flakes in the sun; landing, cleaning, washing, &c., at sardine cannery, Eastport, Maine. Herring too large for canning as sardines were dried and and sometimes smoked. The last smoked sardine plant, McCurdy's Smoke House in Lubec, was forced to close in 1990 as it could not meet today's sanitation regulations. 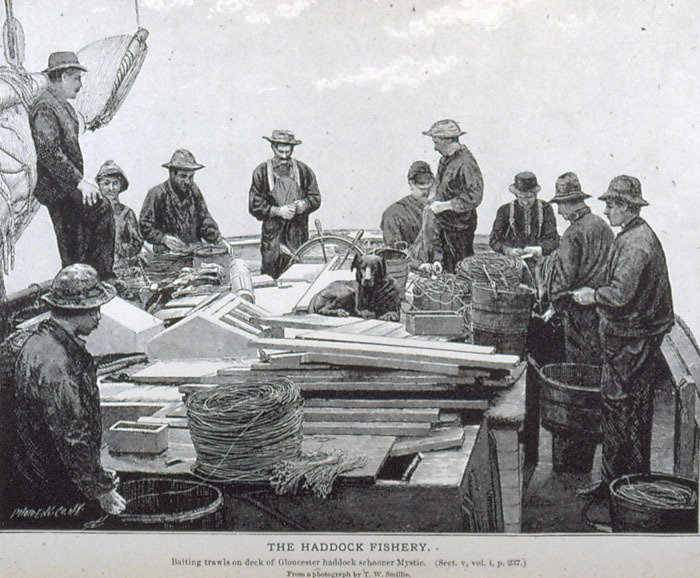 This image is from G. Brown Goode's The Fisheries and Fishery Industries of the United States, 1884-1887, Section V, Plate 140. This book can be found online at NOAA. 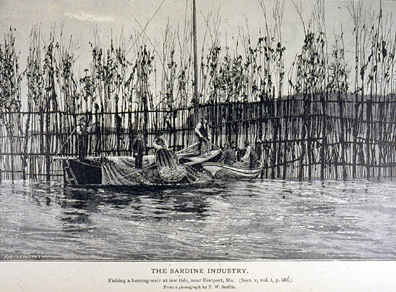 Whole families worked in the sardine canneries that were common in Eastern Maine towns like Eastport and Lubec by the 1880s. Here men and boys are cutting off the heads and tails, and cleaning small herring for canning. Wives and daughters were most likely working inside the building filling cans before they were sealed and cooked. This image is from G. Brown Goode's The Fisheries and Fishery Industries of the United States, 1884-1887, Section V, Plate 137. This book can be found online at NOAA. Unloading herring at a sardine cannery, Eastport, Maine. A carryaway boat or Quoddy boat is alongside loaded deeply with herring carried in from a weir (fish trap.) 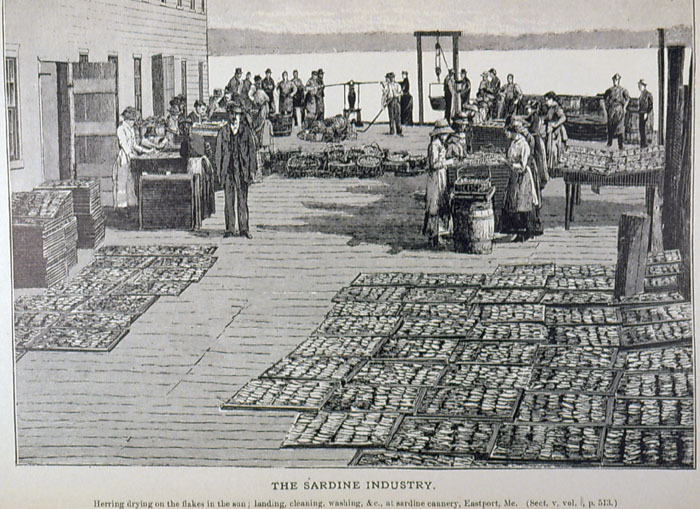 Sardine canning started in 1875 in Eastport; by the time of this image there were at least 13 canneries of which many burned in a major fire in 1885. 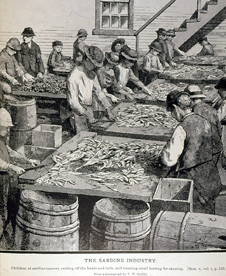 By 1900, however there were about 20 canneries in Eastport, and about 75 in Maine. Seine-boat and crew "paying out" the seine. 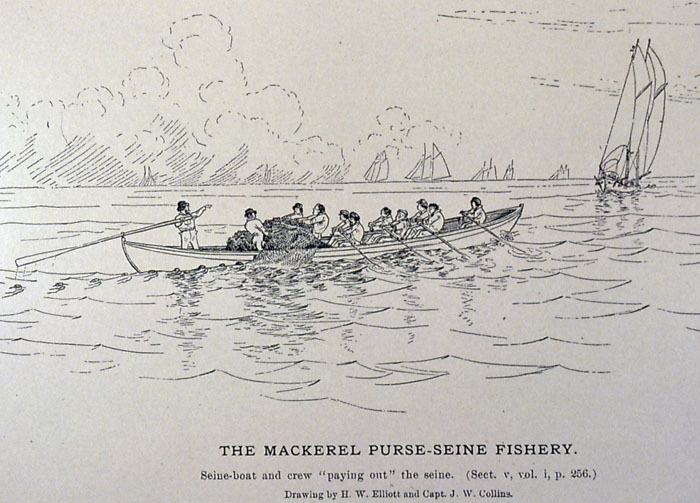 A school of mackerel has been spotted, and the fishing crew are rowing the seine around the school. This image is from G. Brown Goode's The Fisheries and Fishery Industries of the United States, 1884-1887, Section I, Plate 62. This book can be found online at NOAA. 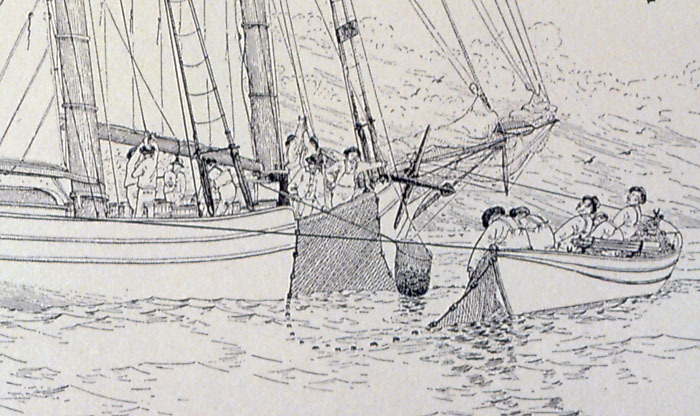 Schooner with crew at work bailing mackerel from the purse-seine. This image is from G. Brown Goode's The Fisheries and Fishery Industries of the United States, 1884-1887, Section V, Plate 64. This book can be found online at NOAA. 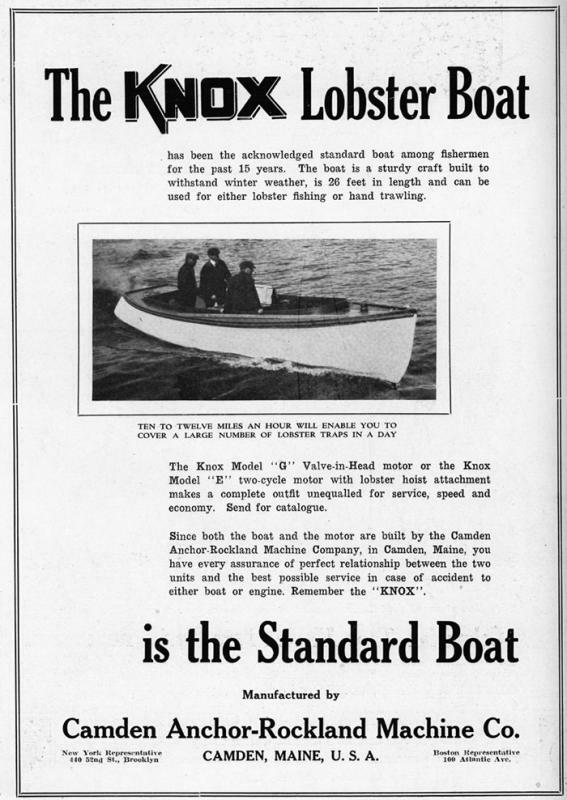 Atlantic Fisherman magazine advertisement for the Knox Lobster Boat, built in Camden by Camden Anchor-Rockland Machine Co. The company built both the boat and the engine. The boat was sold for use as a lobster boat and for hand trawling. Small engines had been available to fishermen starting in the early years of the 20th century; by 1907 they were common, and boats were being adapted for them. This advertisement is from page 2 of the July 1921 issue, the first year that the Atlantic Fisherman, the nation's first fisherman's magazine, was published. 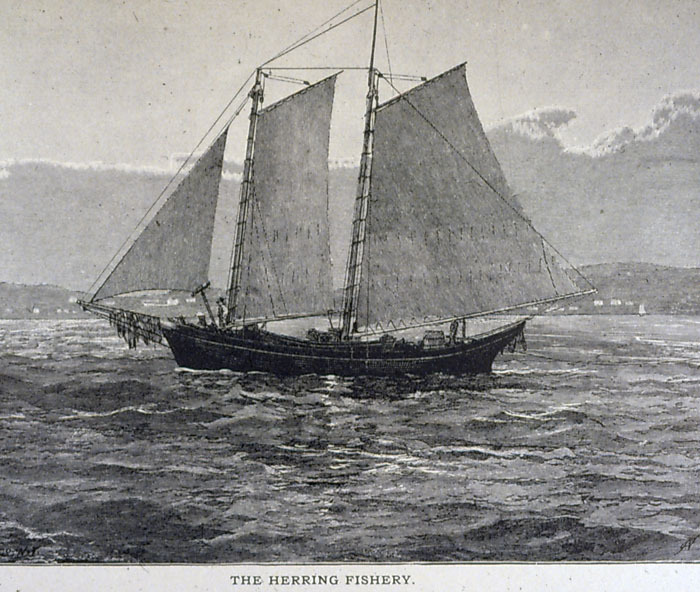 Baiting trawls on deck of Gloucester haddock schooner Mystic. This could also be a scene for cod fishing. 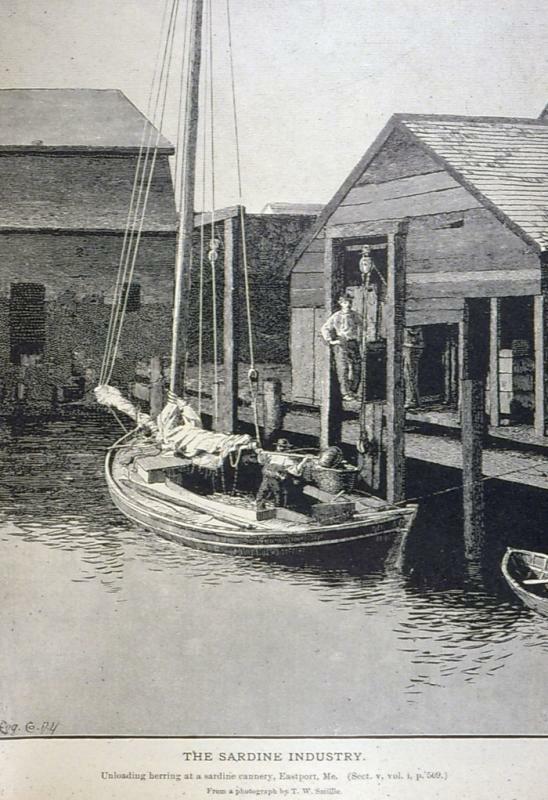 This image is from G. Brown Goode's The Fisheries and Fishery Industries of the United States, 1884-1887, Section V, Plate 48. This book can be found online at NOAA.